Since there were not enough time for Q&A in the Tokyo seminar, the speakers from Alaska replied to the questions which participatns asked in the questionnaire. 1. How do you reconcile the difference in speed between knowledge transfer by elders and societal changes? 2. How long does it take to conduct Yaaveskaniryaraq Project? 3. Do you record elders� knowledge in a film? 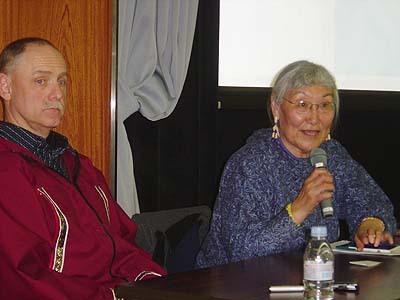 Elder痴 knowledge is being recorded on video in many communities, including getting students in the schools involved in conducting interviews and producing documentaries of traditional knowledge and skills. 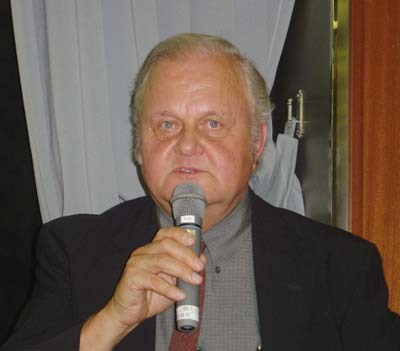 See the following web sites for examples: http://www.babiche.org/about.html and http://www.ankn.uaf.edu/NPE/oral.html. 4. What are the issues and problems in conducting the Yaaves program? 5. What are you seeking as an ideal result by what you are doing? 7. If there is a goal in 兎ducation�, what is the goal for you? 8. Why do the youth leave villages? 9. I heard that it is increasingly difficult to protect the nature in Alaska in Bush administration. Does this have any influence in the life of native people? 10. Do you think it is meaningful to learn about other places outside of your own? 11. What do you feel lacking in environmental education and place-based education in Japan? 12. Culture changes. How do you view the culture and what is your approach to teaching it? Do you teach the culture cores which do not change or as way of thinking? 13. Japanese school education attempts to raise the students� motivation by competition, which I believe is a mistake. Do you make much of 田ooperation� in Alaska? 14. Please give me a hint what we can count on in a place where we lost things which should have been protected. 15. What are the problems that westernized Alaska Natives face? 16. How do you define 菟lace� in place-based education? 17. How would you interpret and explain why Japanese and Alaska natives have similar way of thinking and viewing the nature? 18. I have an impression that Yaaveskaniryaraq takes a method of story telling. Do you do other activities and discussion programs in Yaaves? 18. Are there many female elders? 19. What do you think about the wealth in the western concept? 20. Has the efforts to keep native痴 culture been done as volunteer bases? 21. What is an important thing for human beings in life? 22. How is story telling maintained?